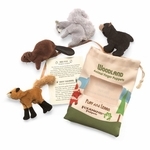 Folkmanis 2769 - Kids can have hours of creative, on-the-go playtime with the Folkmanis� Woodland Animal Set. Perfectly portable, find four finger puppets of black bear, gray squirrel, beaver, and red fox along with species information in the colorful canvas carrying case. Finger puppets. Storage bag measures 8� wide x 5� tall.